If you’ve ever heard a talk by a “motivational speaker,” you know that we all should find our passions and pursue them. That’s what makes life fulfilling. I said it myself in a keynote address I presented to the 2012 Student Citizen Awards Breakfast, sponsored by the Clintonville Area Chamber of Commerce. I asked the rhetorical question of my middle-school-aged audience, “What does it mean to find your passion?” Here’s some of what I told them. Let me tell you a story of how I rediscovered mine. A few years ago, some friends of mine gathered at my house to learn to do line dancing. Just imagine four middle-aged women, shakin’ their boodies, and clappin’ and singin’ “My Achy Breaky Heart.” We had a blast. That’s when I realized that what was missing from my life was my passion, dancing. When I was 14, I started taking lessons in tap, ballet, and what was known back then as modern jazz. I was a very serious student. I was in love with dance. I even had dreams of someday dancing on Broadway. Then at age 18, the diagnosis of retinitis pigmentoasa, a progressive eye disease, dashed my dreams. I was told that it would probably result in total blindness, and it did. I put away my dreams of a career in dance, went to college, got married, got a job in social work, had two children, and tried not to think about it. In the meantime, I taught dancercise, joined a singing group, learned to cross country ski, took up cycling and hiking, got involved with other interests such as church and toastmasters, and yet…. I didn’t know what was missing from my life until we danced that night in my family room. I needed to dance. “But how?” I asked myself. “I’m 50 years older now and totally blind. How can I dance?” then I thought about ballroom dancing. With a partner, I wouldn’t have to worry about falling off the edge of the stage. 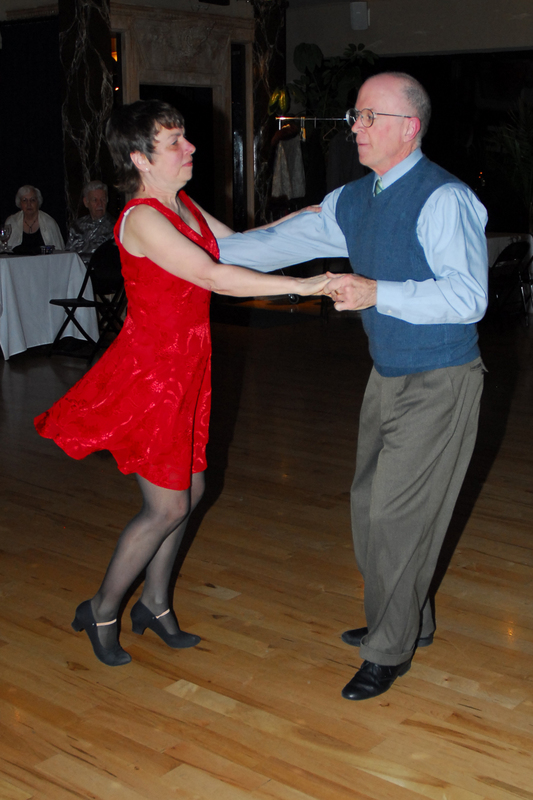 I had always loved the waltz, and I was fairly good at other dances such as swing, rumba, and cha cha. I had longed to learn to tango. Remember “Scent of a Woman?” I called Dance Plus Ballroom and scheduled a lesson. That first afternoon, when I stepped out onto the dance floor at the studio, I breathed a huge sigh of relief.. This is where I belonged. I was home. I learned later that I was my teacher’s very first student. Imagine starting a new job as a dance teacher, and your first student was blind. It didn’t bother Mark at all. I told him that I had taken years of dance lessons, so he didn’t need to start with teaching me the box step. I recall that I said to him, “I could teach you the box step.” So of course, the first thing he taught me was the proper way to do the box step. I discovered that there was a lot I didn’t know. Mark was everything a good teacher should be, kind, patient, diplomatic, and all with a good sense of humor. Because he expected me to dance well, and because he knew how to help me improve my style and technique, we didn’t zoom through a hundred steps. He made sure I executed each one with good form and confidence before moving on to the next. Because I didn’t have a partner, and being in a class would not have worked for me, I took private lessons for several years. Mark served as my partner in competitions at the studio. Other dancers were often complimentary to me about my dancing, but more important, Mark enjoyed teaching me, and I felt joy again. Mark was careful to describe every step with words. There was never a “go like this.” Here was a place that being blind was not even noticeable, not even to me.